This article refers to meteorology. For the airborne base of the TV series Captain Scarlet and the Mysterons, see Cloudbase. The cloud base (or the base of the cloud) is the lowest altitude of the visible portion of the cloud. It is traditionally expressed either in m or feet above mean sea level (or planetary surface), or as the corresponding pressure level in hectopascal (hPa, equivalent to millibar). The height of the cloud base can be measured using a ceilometer. This device reflects a beam of light off the cloud base and then calculates its distance using either triangulation or travel time. Find the difference between the surface temperature and the dew point. This value is known as the "spread". Divide the spread by 4.4 (if temperatures are in °F) or 2.5 (if temperatures are in °C), then multiply by 1000. This will give you cloud base in feet AGL (Above Ground Level). A shortcut to the above method when temperatures is measured in °C is to simply multiply the spread by 400. In well-defined air masses, many (or even most) clouds may have a similar cloud base because this variable is largely controlled by the thermodynamic properties of that air mass, which are relatively homogeneous on a large spatial scale. This is not the case for the cloud tops, which can vary widely from cloud to cloud, as the depth of the cloud is determined by the strength of local convection. Clouds greatly affect the transfer of radiation in the atmosphere. In the thermal spectral domain, water is a strong absorber (and thus emitter, according to Kirchhoff's law of thermal radiation). Hence clouds exchange thermal radiation between their bases and the underlying planetary surface (land or ocean) by absorbing and re-emitting this infrared radiation at the prevailing temperature: the lower the cloud base, the warmer the cloud particles and the higher the rate of emission. For a synthetic discussion of the impact of clouds (and in particular the role of cloud base) on the climate system, see the IPCC Third Assessment Report, in particular chapter 7.2. Cloud base is an important meteorological variable for aviation safety, as it determines whether pilots may use Visual Flight Rules (VFR) or must follow Instrument Flight Rules for take-off or landing. 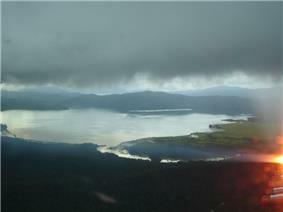 Photo of a cloud base taken above the Island of Sulawesi, Indonesia (2005).